HomeHow to vote for Allison! (1) Find the WARD COUNCILOR WARD 4 race on the back of the ballot (at the bottom of the middle column). 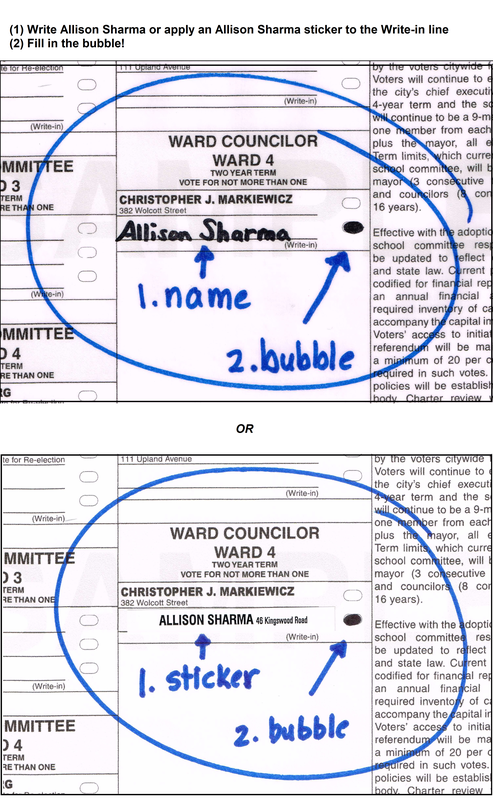 (2) Either write ‘Allison Sharma’ or apply an ‘Allison Sharma’ sticker on the Write-in line. Stickers will be distributed in advance of Election Day and also available at all three Ward 4 polling locations on Election Day. (3) Fill in the bubble corresponding to the Write-in line. That’s it!